Passover has always been my favorite Jewish holiday. The story of freedom, the props – 10 plague finger puppets, the inflatable matzah beach ball, the food (you know your yearly serving of gefilite fish was something to complain about BUT also an awesome way to get an extra dose of horseradish), the fashion (when your childhood dining room includes the stairs to the kids bedrooms, you have a perfect runway and a captive audience waiting to see a demonstration of the most trendy 4th and 5th grade spring fashions)! But, most importantly, Passover was a time to celebrate with family and with family friends that might as well be family. While nothing beats celebrating with family, living a four hour drive from mom and dad, and having a hectic professional and personal life (I’m a fundraiser during the day, and Passover somehow ALWAYS coincides with event season at work), it’s become more and more difficult to make the trek to northern New Jersey to eat, celebrate, and drink four glasses of wine with my peeps. I guess this is what growing up means. I’ve been lucky though, as I’ve hosted friends and they’ve hosted me, and despite being far away from home, Passover remains my favorite holiday. This year, I was getting nervous. As friends began to pair off, have babies, and move away, and with my mom and dad heading down to Florida, I thought: would this be a year that I just had to take Passover “off”? That’s when Eser came to the rescue! For the past two years, I have had the privilege of spending my Monday nights in Cambridge (a big deal for a Brookline devotee like me), learning, discussing, and making new friends through Eser, Hebrew College’s young adult learning program. Regardless of the busyness of life, the long days at work, and all of life’s competing “stuff”, come spring time, my Monday nights are booked with new friends, old friends, riveting discussion, and things to think about outside of my regular scope during the week. Like its theme this year of “Ten Best Kept Jewish Secrets,” Eser really is the Jewish community’s (and my!) best kept secret. With a week to go before Passover, Elisha, our Eser facilitator asked what we were all doing for Passover. A few of us looked around and realized that despite all wanting to celebrate together, we were Passover “orphans” and didn’t have a place to celebrate. And from there, we mobilized. Erin offered to open her apartment to us, Leah was going to make the haroset, Olivia was all over the ever-hard-to-find-last-minute shank bone, and Bart and Laura took charge of a side dish and the seder plate which they got from their JewishBoston.com “Seder in a Box.” I was very happy to have an excuse to make Emeril’s Passover Brisket again (have you tried it? It’s AMAZING), and have an audience for my Passover playlist. 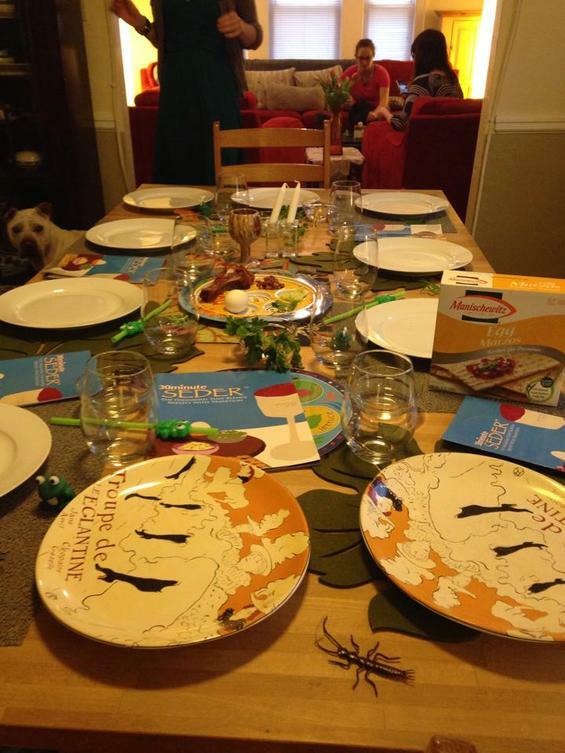 On Monday night, as Jewish families around the globe came together to celebrate the first night seder,11 of us came around Erin’s dining room table to celebrate the festival of freedom. Our “family” included friends from Eser, roommates, college classmates, and Erin’s “little sister” and her mother from Jewish Big Brothers Big Sisters. It truly was a family affair. Yes we somehow made the “30 Minute Hagaddah” an hour and a half long (and this was BEFORE the festive meal), yes there was a “situation” with the Matzah Balls (Erin to the rescue! ), but despite missing being with my family, it was an incredible evening of celebrating, learning, discussing, and of course eating. We talked about when we felt the most free (which included everything from painting to volunteering to driving on the New Jersey Turnpike) and we learned from each other and each other’s traditions (our seder included Jews from a variety of backgrounds, those considering converting, a Catholic, and a Pagan). It was an untraditional new tradition. And it was lovely. Robin is a proud Boston transplant with strong Jersey roots and passionate about the well-being of children, learning, and Trader Joes. Outside of her job as nonprofit fundraiser, you can find her attempting to become a runner, volunteering in the community, and eating nachos. She has participated in Eser for the past two years.